During her son’s 10-year struggle with cancer, award-winning writer Vivienne Plumb recorded the journey in some of her best poems. Now collected together, with several new and previously unpublished poems, they tell a powerful story of love, sorrow and celebration. 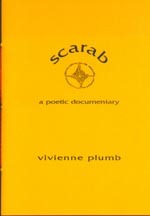 Plumb’s poems are like a documentary camera, recording slices of life – travel, swimming, frequent visits to hospitals. But off to the side, sometimes almost out of shot, is the constant reality of her son’s illness. The poems tell the story of Willie Plumb’s diagnosis, illness and death at only 27. Grief does not disappear after the cataclysmic loss, but becomes a daily, almost mundane companion: ‘The second year is harder, I must explain. / He has been gone longer’. The poet’s mix of documentary-style objectivity, wry humour and skilful writing makes great poetry out of a topic that in the hands of a lesser poet might turn maudlin. Plumb’s usual playful writing style is very much in evidence, even in the darkest poems. The title, taken from a line in the poem ‘On the Way to Scatter the Ashes’: ‘Oh, the iridescent scarab greenbacks / of beetles shine behind my eyes’, is also a reference to the scarab beetle as a symbol of life after death to the ancient Egyptians. This exquisite collection is hand-bound with a vibrant yellow dust cover. The poems are accompanied by photos taken by Willie Plumb during a visit to Athens and Rome. The collection is a tribute to his courage and determination to get on with life in the face of his illness. Vivienne Plumb is one of New Zealand literature’s all-rounders. As well as being a poet with three published collections, she also writes short fiction, drama, and has published a novel, Secret City. 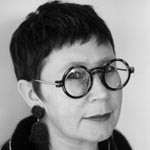 She has received a number of awards and fellowships, including the Buddle Findlay Sargeson Fellowship in 2001 and, in 2004, an international writing residency at the University of Iowa, USA. In 2010 Seraph Press published Vivienne's new poetry collection Crumple.